Some dishes are just too good to only have them once. 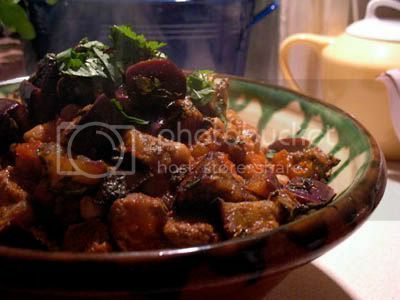 Spicy Roast Aubergine with Chickpea Stew and Jewelled Couscous is definitely one of them for me. It is one of my favourite vegetarian meals, but when I made it last Friday I felt like experimenting a little and added some lamb. I did everything as in the original recipe, but when making the chickpea stew, I first fried some chopped up lamb shoulder until sealed, before adding the onions and all the other ingredients. Of course it meant that the stew had to cook for a lot longer than in the vegetarian version. I simmered it on low for about two hours, stirring from time to time. Everything else stayed exactly the same and the result was just wonderful. I still think that the original is great just as it is and doesn't really need the meat to be a perfect meal, but for those who need a little meat in their dinner to be happy or just to make a change, the lamb is a great addition. This coming weekend the annual Art Book Fair returns to London at a new venue. Previously it was held at the ICA. This year it will be at the Whitechapel Gallery for the first time, but with hopefully just as many exciting stalls and exhibitors. So, if you are around and are looking for some wonderful handmade and limited edition art books, gifts made from paper, cards and much more why not pop in. I'll be on the Righton Press Stall for most of the weekend and as well as selling I am really looking forward to having a good browse, chat with other artists, read and to buying some special Christmas presents myself. Katiecakes! Congratulations! I have e-mailed you. Thanks to everyone who entered. Sorry you couldn't all win. You can blame it on my colleague G if you didn't win, as he was responsible for picking the name from the hat. Maybe you are like me and are planning to go and see Julie & Julia at the cinema. I know it looks a bit cheesy and chick flicky, but I can't always just watch serious intellectually stimulating foreign films. Occasionally, I need a bit of Hollywood escapism. Therefore, a film that has Meryl Streep in it and is about food seems like a good choice. Well, this is where the giveaway comes in. The lovely people at Duckworth Overlook sent me two copies of the book the film is based on, Julia Child's (with Alex Prud'homme) My Life in France. One copy is for me to read and the other copy is for one of you. All you need to do, to be in with a chance of winning the book, is to leave a comment on this post before the 15th September 2009. I will be drawing one of the names at random and send the book to the lucky winner. Unfortunately, this giveaway is only open to UK residents, due to issues to do with publishing rights. I know. It has been a long time. I needed a break and I took it, traveling out to the Western Isles and Germany and also just enjoying time with friends at home. If you want to see some of the places I went and some of the things that I saw have a look at Photobooth. I'll let the pictures do the talking this time. 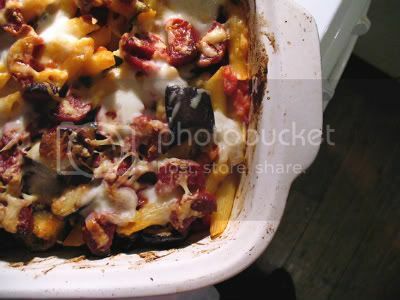 I finally got back on Saturday and yesterday E and JM came up for a simple dinner of Chorizo and Vegetable Pasta Bake. I got the recipe from a card I picked up at Waitrose in Edinburgh. It appealed to me instantly with it's few simple ingredients. I adjusted it slightly as it needed garlic and more cheese in my opinion, but the main ingredients didn't change. At one point the original recipe just states to season the sauce, but not how, so below is my take on seasoning as well. Heat some oil in a frying pan, add the basil and garlic and fry for 30 seconds before adding the chopped tomatoes. Simmer for 5 minutes and season with the vegetable stock powder, sugar and salt and pepper to taste. While the vegetables are frying cook the pasta in plenty of salt water until al dente, drain and mix with the tomato sauce. Transfer into a large baking dish. Cut the cooked vegetables into strips and carefully stir into the pasta. Tuck the chorizo into the top of the pasta and top with the grated cheese and fresh mozzarella.